Recently I shot with Kira Floofie for a portfolio development shoot at Cobalt Studios. This is a quick look at how that went down. Take a look at the finished work, or my people portfolio. I recently ran an automotive light painting experiment and just posted a video about doing it. I have been doing the majority of the research for my book on Oregon aviation history at the Oregon Aviation Historical Society. In the process, I’ve gotten to know many of the people there pretty well, leading to many things, including my first editorial assignment. Recently, a Murphy Rebel, a small homebuilt plane was donated to them. They want to sell this aircraft to fund the restoration of some of their other aircraft and they asked me to take some photographs of the plane to help them in that endeavor. The Rebel is a pretty good bush plane, so they came up with the idea of photos that made it look like someone was camping out of the plane along a river. So we set up this whole scene with a tent a fold-up chair and a picnic basket. It created a scene that looked pretty darn cool. I had an idea for a photo that didn’t work quite as planned, but is still cool. The idea was to put CTO on a flash and set the color balance on the camera to tungsten. Then I would underexpose the ambient light and properly expose the flash. My speedlight wasn’t powerful enough for the scene to look as I’d hoped, but it still looks pretty cool. Serendipity came in when one of the board member’s dog thought that under the plane looked like a pretty good place to rest. Initially, we tried to convince him to move, but eventually decided that he adds to the photos. On July 11, I went to the 2015 WAAAM Traffic jam. This is a two day car show at WAAAM. However, day one is largely for the participants and there is not as much for the public to do as on Saturday. Saturday however, is pretty awesome. This year was particularly nice for me. It was an unusually cool day for this summer. As warm blooded as I am that was very nice. It was also usually overcast light, but the clouds were broken enough to make for interesting skies. This was fantastic photographically. The only down side was that it was a bit windy; windy enough that WAAAM didn’t do any flying like they normally do and the plane they pushed out had to be tied down very securely. I also had a few things blow out of my camera bag that I had to chase down. As far as what was on display, it was really cool as I saw several old cars that I had never seen in person before, but knew about from the History Channel’s Counting Cars. Most notable among these was a ’55 Oldsmobile 88 and a ’57 Buick Roadmaster and I spent a great deal of my photography time on these two cars. Another thing I do a lot of at these shows is creatively lit close-ups. Getting classic car portraits at car shows is difficult, because there are so many other cars around. This makes it a perfect time to experiment with these close-ups. A different shot I discovered can work well at this show was the stand directly in front of the car and look down shot, like I did with the Union Jack XKE. I recommend you attend this great show next year. Take a closer look at the images from the 2015 WAAAM Traffic Jam, or take a look at my automotive portfolio. 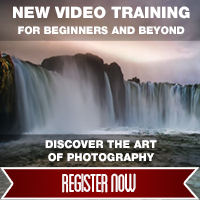 Is Video Good for Photographers? ≈ Comments Off on Is Video Good for Photographers? Behind the Scenes Classic Wings Aero Services Shoot from Rick Brown on Vimeo. There has been much talk in recent years about how video is important to the business model of photographers these days and in the coming years. I have dabbled in video and not had much business success with it. Although admittedly, I have had a little. For example, my stock agent recently licensed a clip of mine to a major motion picture. I’m not sure which one, but I know she licensed many clips from several photographers to “Noah.” However, I do know of at least one local photographer who has been doing a significant amount of directing these days; Carli Davidson, the photographer of Shake, the well known book. Thus, my experience with the business success of video isn’t necessarily indicative of what to expect. The learning curve is also difficult. It takes a good long while to figure out what looks good as motion. Furthermore, if you plan on doing your own editing, something most photographers will probably need to do, at least in the beginning, the editing software has a very steep learning curve. One aspect I can guarantee you will only be positive about video though, is it is fun. I know I have had a blast with it. I think most photographers probably have the mindset that we will enjoy any visual medium we can get the hang of. By that I mean, I don’t enjoy drawing or painting that much, because I don’t have the best hand/eye coordination and don’t do this sort of artwork well enough to meet my standards. I’m sure though that if I could, I would have a blast painting. Anyhow, I can’t tell you whether you should get involved in video or not, but I hope I gave you some things to think about. Take a look at some of my other video work. As a high school senior I was taking physics. I have always been very interested in science and thus took pretty much every science course my high school offered. Physics went very well for me overall, with a minor hiccup when we were studying electronics. As the school year was coming to a close, a young lady who sat next to me in class asked if I’d tutor her in physics. I agreed. What I discovered while helping her with the material is that doing so was absolutely the best way to study. By explaining the class material to her, I found that I was learning the subject material very thoroughly, without any additional study. I continued getting my A in the class, in fact my test scores were now perfect, and I was putting far less effort into the class. I always value this sort of efficiency. Fast forward ____ years (exact number withheld for authors pride, or is it that I’m too old to remember :)) and I run into a photo student while shooting some stock at Governor Tom McCall Waterfront Park in Portland. She asks me for some tips regarding her exposures for the exercise she is shooting. Her curriculum has her shooting manual all the time. I have mixed emotions about this, as I feel it is a good way to learn but not sure how much a photographer would do this in the real world. I do usually shoot manual while using flash, (find it easier to balance ambient and flash in the unusual ways I like) but pretty much always aperture priority when using available light. Anyhow, I help her with the exposure advice. We exchange business cards. I head home. Approximately, a week later she contacts me and asks if I can help her shoot some portraits for an extra credit assignment. I agree and we make arrangements to meet at the same location. She and her friend had come up with the idea of photographing the friend in her wedding gown, with some red rubber boots, with a very quirky “disgruntled bride” kind of flair to them. Sounded like fun. We got there, I read over her assignment and we got to work. After she shot the first scenario, I asked if the two of them minded if I snuck in some shots. I need to update my portfolio, so I wanted to get some images, although I definitely wanted to keep her learning as the priority. So we proceeded taking turns with the shooting. We shot available light first, as her assignment was available light and then I gave her some tips on my flash techniques. In the end, it was a very fun day, I met a couple of cool ladies and I was able to make some images I doubt I would have ever made had this situation not come up. Take a look at the crazy redboots shoot. Or my current people portfolio. I had been at Pearson Field to do some photography for an aviation history project I am doing. Right next door is Fort Vancouver and with my interest there was no way I was going home without stopping by the fort. 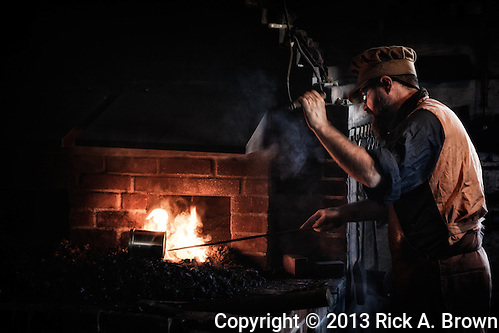 When I walked in to the blacksmith shop I immediately saw the potential for this shot and was very excited about it. It took ISO 6400 to make it work, but that didn’t bother me that much as I felt I could use significant noise reduction without it damaging the shot relative to look I wanted. The light was such in the room, overall very dark but with a window or two and the fire, that I expected to have almost this look straight out of the camera. However, my 5dII handled the shadow detail so well in this instance that what I actually got was this. Therefore, I started with this image in Lightroom increasing contrast a great deal and darkening the image especially the shadow a lot. 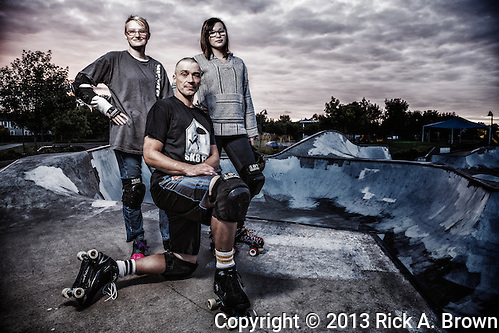 Then I opened the image in Color Efex Pro4 and ran the Bleach Bypass Portrait recipe. The Bleach Bypass filter needed a little customization in brightening the image a tad, but that was all the customization necessary. Here is a gallery of the rest of my Fort Vancouver Images. All are available for wall art and editorial licensing, some are available for all uses. Last year, I attended my first Hood River Fly In and had a fabulous time. Since then I have become more involved in WAAAM, so this year when the Fly In rolled around on September 7, my dad and I split a volunteer job. The coordinator for the event, Ken Olsson, had mercy on me an assigned us to a job that would allow for lots of photo opportunities; we were to sit and one end of the taxiway and make sure people did not walk on the taxiway. As it turned out, we also ended up doing a lot of other things. We helped push planes to and from their parking spots, and for a brief time I even directed the aircraft traffic. It was a lot of fun. There is definitely a good feeling associated with this sort of work. I must admit there were some downsides to the day; it was hot for one. The bigger downside is about an hour into our time there a CF card failed on me and I lost all of my early morning shots. We arrived just as the sun was cresting the ridge to the east of the museum, so they were some images with fantastic light. These are my only two complaints about the day however. Overall, I’d say I enjoyed the 2013 Fly In even more than 2012. Most of my favorite planes from 2012 returned, plus there were some new ones I dearly loved. For example, there were two Howard DGAs there, two Lockheed Electras, two DeHavilland Beavers, and a Ryan SCW. Take a closer look at my 2013 Hood River Fly In images, or take a look at my aviation portfolio. I promised that I’d be back to talk about the environmental portraits. In the planning and run-up to doing this shoot I was very excited about the environmental portraits. They were not the primary reason for the shoot, those were the stunts, but I felt that we could do something really cool with these. I feel that the results bear that prediction out. For the most part, I was aiming for the same kind of impression with these images as the stunt photographs; a larger than life, heroic look. The sky helped a lot. My part in that equation was to shoot low with my 24-105 at its widest setting and fairly open apertures; I shot the majority of the portraits at f/5.6. I did the post processing pretty much the same as the stunts and I detailed that pretty closely in the previous entry, so I won’t bore you with the details again. I would like to point out that with a shallow depth of field it is pretty important to control the Detail Extractor filter in Color Efex Pro4 pretty carefully as it looks strange applied to out of focus things. One challenging part of this portion of the shoot was I tried to get some family portraits that had the heroic feel and captured some family interaction simultaneously, producing one of my favorite photos. I’ll let you decide if I combined drama with the family interaction well. I love doing this sort of shot and one of my fantasy gigs would be to get an assignment to go to the Reno Air Races and photograph the racers in front of their planes in this style. Can you imagine a photo of Steve Hinton in front of Voodoo done in this style? Check out my portrait portfolio or the entirety of the skating shoot.